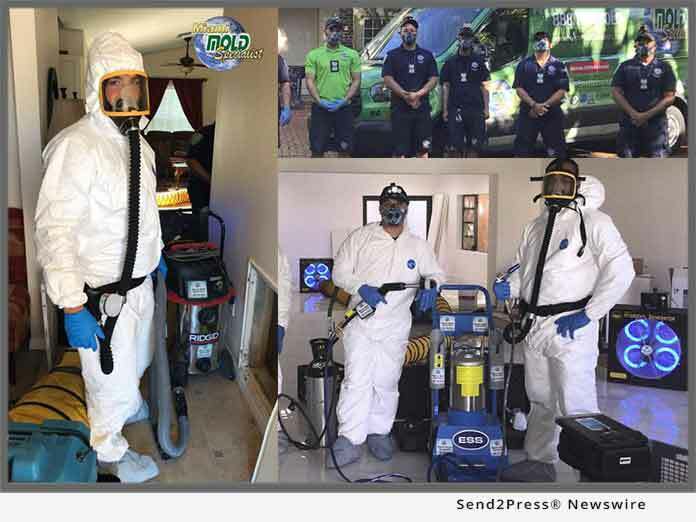 MIAMI, Fla. /Florida Newswire/ — High tech South Florida based mold removal company, Miami Mold Specialists, invests into advanced anti-cross contamination and personal protection systems. Cross contamination is one of the biggest unspoken concerns among indoor environmental and mold remediation companies. Even with using disposable clean suits, spreading contaminated particulates from job site to job site is one of the most problematic issues indoor air quality and mold removal companies deal with on a day to day basis. Miami Mold Specialists’ latest state of the art personal protection and anti-cross-contamination equipment include specialized work shoes, UV footwear sterilizing systems, new types of clean suits and protective footwear covers, and high tech respirators. “Every day our indoor environmental and mold removal technicians implement many proactive tactics to prevent cross contamination. Some of these tactics include clean suits, respirators, shoe coverings, cleaning equipment after every job, daily cleaning of vehicles are all part of our routines as to inhibit cross contamination. Our latest state of the art addition to our PPE equipment line up takes our anti-cross contamination protocols a step further. All of our certified specialists have aerobiotic clean suits for disinfecting so we do not cross contaminate from job to job, utilize our exclusive eco-friendly airbiotics solution, with our latest additions being anti-bacterial disinfectant sneakers, special sneaker coverings, and state of the art UV powered shoe disinfectant and sanitation systems,” stated a spokesperson for Miami Mold Specialists. Miami’s premier indoor air quality, mold remediation service provider – Miami Mold Specialist: High tech and eco-friendly indoor air quality, mold inspection, mold testing, and mold removal services. Multi certified, licensed, bonded, and insured. Over 30 years’ experience!